Professor Skripov obtained worldwide recognition with his monograph "Metastable liquids", published in English by Wiley & Sons. 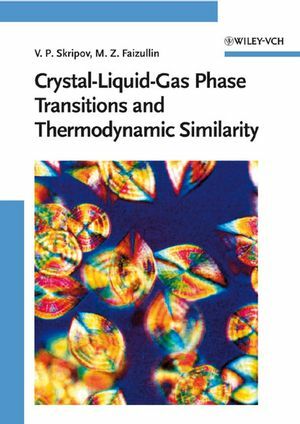 Based upon this work and another monograph published only in Russia, this book investigates the behavior of melting line and the properties of the coexisting crystal and liquid phase of simple substances across a wide range of pressures, including metastable states of the coexisting phases. The authors derive new relations for the thermodynamic similarity for liquid-vapour phase transition, as well as describing solid-liquid, liquid-vapor and liquid-liquid phase transitions for binary systems employing the novel methodology of thermodynamic similarity. Vladimir P. Skripov has been working as a senior lecturer, professor, and dean of the Physico-Technical Faculty of the Ural Polytechnical Institute and from 1972 was a Director at the Ural Science Centre of the Academy of Sciences of the USSR. A thermophysical school has been formed under his guidance in 1988. At present he is adviser of the Russian Academy of Sciences (Institute of Thermal Physics, Ekaterinburg). Professor Skripov is a laureate of the State Prize in the field of science and technology. Mars Z. Faizullin studied physics at the Ural Polytechnical Institute of Ekaterinburg, Russia. His research focuses on the experiment and theory of phase transitions and phase metastability in one- and multicomponent systems. Since 1975 he has been working at the Institute of Thermal Physics of the Ural Branch of the Russian Academy of Sciences in Ekaterinburg where he accepted the post of Deputy Director in 2002.